Hilbeh is a condiment that is, by tradition, served with Yemenite Meat Soup. There are a few different types of Hilbeh. Here is a video of the basic, whipped Hilbeh, a kind of light foam, reminiscent of not-quite-set whipped Jello, but with a piquant green flavor that adds new layers of flavor to an already richly-flavored soup. If you’re wondering why this seemingly exotic condiment tastes familiar, it’s because it’s made of fenugreek, which is the main ingredient in imitation maple syrups and flavorings. 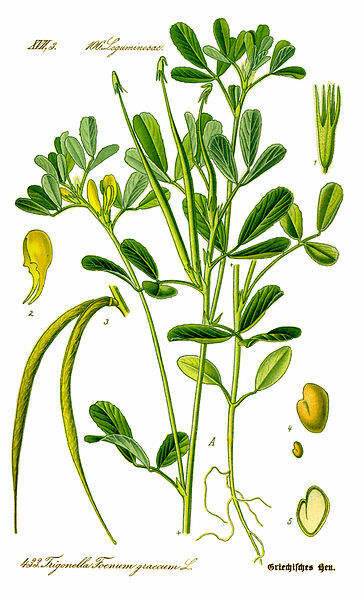 If you like that flavor, fenugreek is for you. But be aware, if you eat lots of the stuff, you will end up smelling like maple syrup, too. Read about it, here.